This is Bazz. He's a black Lab who lives in southern Australia with his owner, Josh Kennett. Other than that, he's a perfectly normal pup. 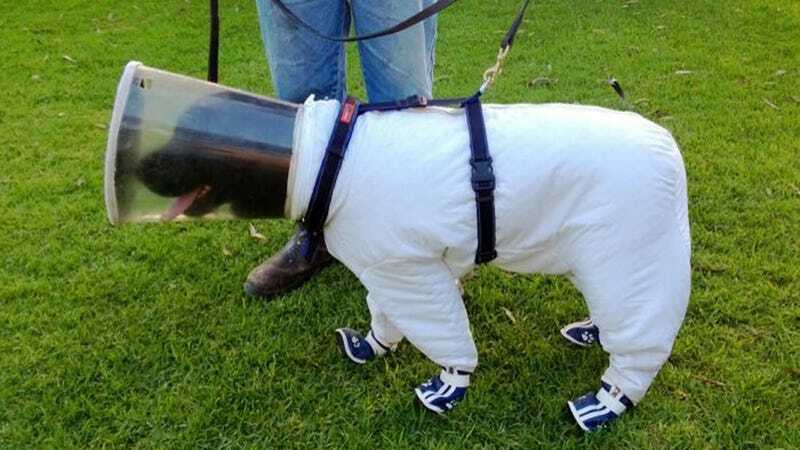 Except, you know, that he's a dog beekeeper, with an incredible dog beekeeper suit to match. You have questions. Let's answer them. Fair point. Dogs don't have opposable thumbs or higher-level brain functions, which makes them an unlikely candidate for beekeeping. But Bazz is not a solo act! He works in tandem with Kennett—who does all of the beekeeping you would expect a human to do—by using his superior snout to sniff out a bee disease called American foulbrood. Is American foulbrood the coolest possible name for a bee disease? Yes! It also sounds like some sort of obscure Korn message board. It's actually a pretty nasty "brood disease," a bacteria that kills bee larvae at an alarming rate. American foulbrood also has a distinctive smell, which can help lead to early treatment. Does the dog like it? Almost certainly not. But don't take my word for it! Kennett says that developing the suit took "a long process of trial and error," and that the hardest thing now is "getting the dog comfortable with the suit." Translation: Honestly, he'd probably rather just get stung. What does the suit look like when there's no dog inside? What does the dog look like when there's no suit outside? Is Bazz a good boy?